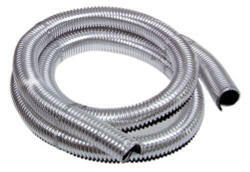 This high quality Chrome wire loom comes with one flexible 72 inch tubing. Great to cover any wiring inside or outside the engine compartment including brake lines, hoses, wire bundles you name it! There is a slit up one side to easily slide the loom over unsightly wires, hoses, lines and much more. Protects from heat and dirt and provides show car - chrome appearance. Snaps into place No glue, ties or tape. NOTE: Diameter size can vary ± 1/8 inch.